2018 was a wild adventure that veered from amazing to horrifically depressing and nightmarish. By this, I mean obviously, the existence of Gotti. Let’s not dwell on that. Without further distraction, here are my favorite TV shows, movies, and games of 2018. I saw this movie so many times, I actually forgot how many times I’ve actually seen it. It was at least three times. Four? Anyway, the last time I saw this many Asian faces was – well, my own family gatherings – and watching Crazy Rich Asians (read my review) was sort of like being around my family. East Asians have endured a great deal as people; from the diaspora, to family secrets and discussions too painful to have decades later, and the warmth of being together and supporting each other. Ours is a universal story, too, and finally, we are seen. What do we owe this planet when we have decimated nature and made it a husk of itself? Have turned our backs to God? What do we have left, if not God? 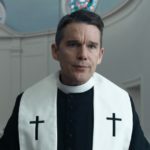 These are central themes in First Reformed, which has been in my brain ever since I saw it. It is Paul Schrader’s angriest screed against the follies of humanity, and Ethan Hawke delivers perhaps the best performance of his entire career. It is an incredible movie that asks big questions through the eyes of one very personal story. These are questions we need to be asking ourselves. Let’s just hope it isn’t too late. Arthur Curry talks to fish! There’s an octopus playing the drums! There’s a whole kingdom of crab royalty! OCEAN MASTER! BLACK MANTA! Aquaman is pure delight. Patrick Wilson brings an immense amount of gravitas to his role as Orm, Arthur’s brother and King of Atlantis. The movie also refreshingly rejects toxic masculinity even as it presents us a hero whose greatest physical feature is his muscles. Jason Momoa is fantastic as Arthur, a would-be king who doesn’t know if he can lead a kingdom because despite his special abilities, he’s also just also a mere man (but not a merman). That’s the beauty of this movie. Special abilities and birthright don’t make us destined for greatness; we have to work hard to achieve great things, sometimes with a little help from our underwater friends. By a miracle called Tom Hardy, this movie works. Despite its editing and plot flaws, it manages to be funny and charming. Michelle Williams is fantastic, Tom Hardy is evolving before our eyes into the kind of bizarre character actor he’s always meant to be, and it also features an actual, heartwarming message of two unlikely heroes (seriously, they’re both kind of bad at everything) becoming friends and adults who act like adults when faced with heartbreak and betrayal. I’ve talked about this movie for what seems like a decade, so I’m committed to finishing the year strong and yet again recommending this incredible film. I keep thinking about those incredible South Dakota landscapes shot at the golden hour and the story of a cowboy who’s forced to adapt when he can’t readily fix his broken body. I’ve recommended it to everyone I know, and there’s no way anyone regrets seeing this movie. Around the time you hear the howling wail of a bear – or is it a person? – you’ll want to hide under some covers. Though Annihilation is nowhere as scary as some critics made it out to be, it is truly unsettling. It’s a surreal science fiction story, meant to upend your idea of what is real and what isn’t, what is invading our planet and what it wants. It reminded me of Arrival in some ways, asking us what we are willing to do to survive. Since this will run during the holiday season, it’s appropriate to wish all of you a blessed morning, and I hope that none of you had your throats slit by malevolencies during the night. It’s quotes like that that imbue The Chilling Adventures of Sabrina with its spooky magic, a pulpy show rich with color and texture and a fantastic set of leads in Sabrina, Zelda, Hilda, Ambrose, and Harvey. To say this was highly anticipated is an understatement. When February 2018 rolled around, the entire country (and the world) was buzzing with excitement to see Wakanda for the first time and a nearly all-black cast. What we got was an epic mash-up of cultures, Wakandan and American, anchored by strong performances, memorable designs, and a sense that the MCU had changed for the better with such a rich new foray into Wakanda. A few days ago, Netflix added season 3 of this wonderfully bonkers SyFy Original show, and I couldn’t be happier. Critics derisively called this ‘horny Hogwarts with booze’ when it began, but they were completely missing out on what was happening beneath the surface. This show, about a band of misfit students with magical abilities and no real concept of responsibility who are suddenly responsible for the fate of magic across several worlds, has hidden layers. 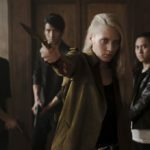 The real gift is in the characters, who are all dealing with that responsibility in surprising (and for some, surprisingly inappropriate) ways. The true highlights of this show are Margo and Eliot, who find themselves ruling a kingdom before they’ve even graduated. Their grasp of diplomacy has to be swift, as they face encroachment, coups, and angry gods.